This post is sponsored by Atkins. All opinions are my own and I only share products I personally love. Thanks for supporting the brands that make this site possible! Let’s face it – one of the biggest things people miss on a low carb lifestyle is bread. That’s why my low carb bread recipes recipe index is constantly one of the most popular areas on Wholesome Yum, and why I’m always so excited to create new ones. This Atkins and keto 90 second bread with almond flour is the latest. When Atkins asked me to create an Atkins-friendly low carb recipe, right away I thought of making Atkins bread. 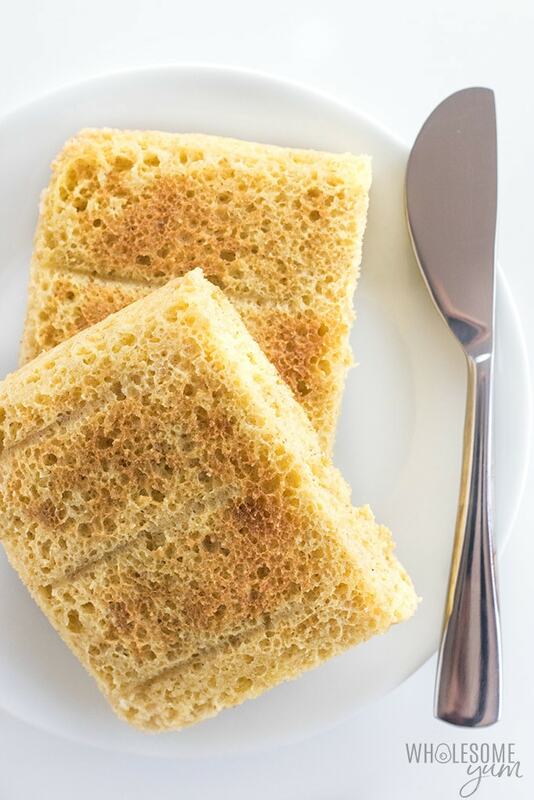 And because so many of us are in a rush these days, I thought that a 90 second keto microwave bread could help many of you. Atkins 20 is comparable to the keto diet, but overall Atkins allows for more flexibility as it encourages people to incorporate foods back into their meals and find their carb tolerance level. Atkins 20, Atkins 40, and Atkins 100 are three low carb eating approaches, each representing the number of net carbs they allow. Having these options is great to cover a wide range of low carb needs. One thing I really like about all of these Atkins programs is that the latest guidelines emphasize real food like vegetables and meat, especially in their new Eat Right, Not Less book. And with their “Hidden Sugar Effect” initiative – calling attention to foods that you think are healthy that actually turn into sugar when digested – they are committed to teaching people to make smarter eating choices. 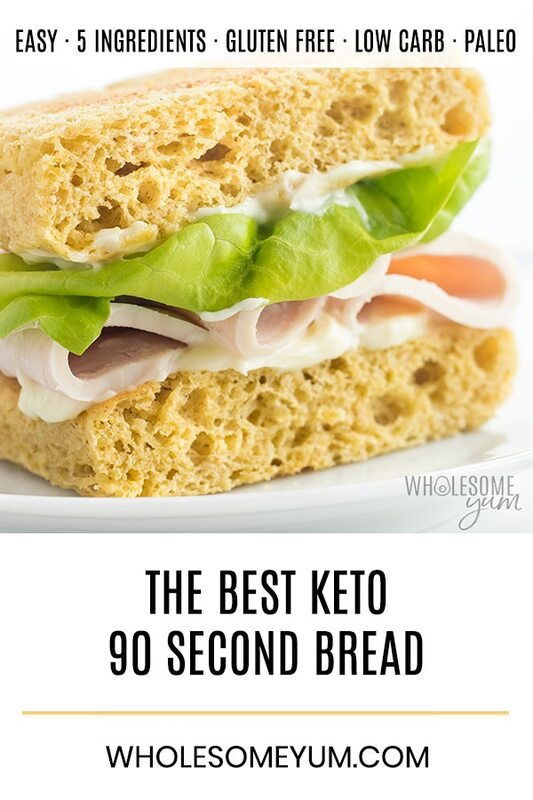 What Is Keto 90 Second Bread? Keto 90 second bread is a low carb, grain-free bread that you can make basically in 90 seconds. It’s perfect if you want an Atkins bread, keto bread, or just a general low carb bread. I’m not sure who came up with microwave bread first, but I’m pretty sure it started out using wheat flour and wasn’t low carb. These days, the name “90 second bread” seems to indicate a low carb microwave bread, and there are various versions of it. In fact, my low carb English muffin is essentially a 90 second bread recipe. 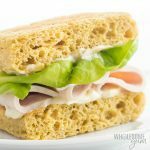 Many of you reported making it for sandwiches and general-purpose bread uses, when you don’t have time to make cloud bread or almond flour bread (both of which I also love!). So, what’s the secret to the best 90 second bread with almond flour? How to achieve a better texture? Psyllium husk powder! I used it in my popular easy low carb bread recipe, and was excited to create what is essentially similar to an Atkins, keto microwave bread version of that. That’s it! Just 5 ingredients, not including the sea salt, which we exclude from the count by convention. If you are dairy-free, you can make the 90 second bread recipe with coconut oil. Or if you’re only avoiding milk proteins, ghee would also work. Either way, the psyllium husk powder is the key to making this keto 90 second bread chewy and giving it a texture that’s like real wheat bread. And as a bonus, it adds plenty of fiber! The process for how to make 90 second bread is super simple. The original recipe was for the microwave, but you can also make it in the oven. If you are making the 90 second bread in the oven, preheat it before starting on the other steps. To start, melt the butter (or ghee or coconut oil) in a glass rectangular container, like this one. It’s oven-safe, so you can use it for both the microwave and oven methods. I melt the butter right in the microwave, but for the oven method, you can melt it on the stove first and then pour it into the container. It usually takes about 30 seconds in my microwave. 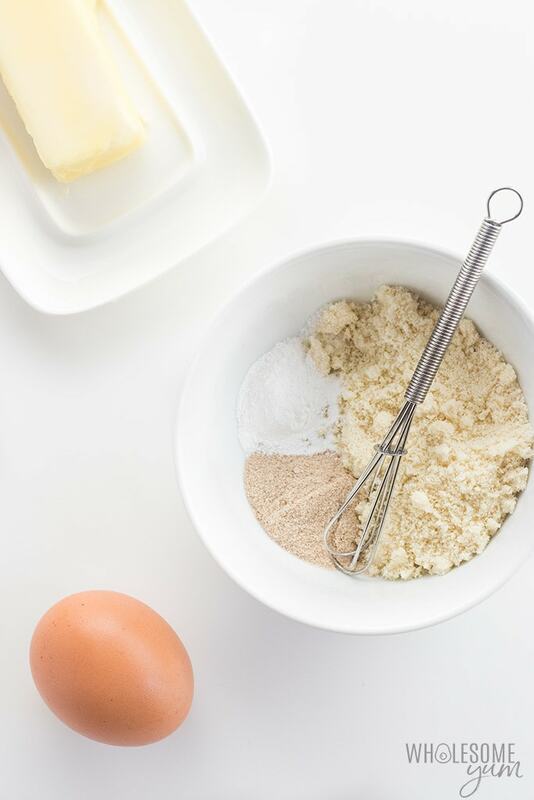 Meanwhile, stir together the almond flour, psyllium husk powder, baking powder, and salt in a small bowl. Once the butter is melted, add the flour mixture to it, then whisk in the egg. Stir it all together and smooth the top so that the batter is distributed evenly. Time to cook the 90 second keto bread. Zap it in the microwave for 90 seconds, or bake it in the oven for about 15 minutes. You’ll know it’s ready when it’s firm and spring-y on top. It will also retract away from the edges a bit. Just in case any edges are stuck, run a knife between the bread and the container on the sides, then flip over onto a plate or paper towel. You’ll end up with a thick, rectangular piece of bread. Cut it in half to make 2 square pieces. Perfect for a sandwich! If you want them thinner, you can also slice them in half. The exact size and thickness will vary depending on the container you used, though. One last step! Stick the bread slices into a toaster. I’m sure you’re impatient to try it, but trust me, it’s so much better that way! And to me, it removes any lingering egg-y taste or smell. My favorite way to use keto 90 second bread is for sandwiches. It’s so quick! My go-to lunch is a turkey sandwich with lettuce and homemade avocado mayo. Homemade Atkins bread is also delicious smeared with some grass-fed butter or nut butter. I usually pair that with some kind of veggies as part of my meal to make sure I’m getting other nutrients. And for breakfast? That’s my favorite. Try a breakfast sandwich with egg, cheese, and either sausage or bacon. If you want to make the 90 second bread recipe in advance, you can! I don’t recommend mixing the batter and letting it sit, though. Instead, cook it and store for later. You can keep it on the counter for about a day, in the fridge for about a week, or freeze for longer. You can even use multiple containers to make it in bulk, and freeze. That way, you’ll always have pre-sliced, Atkins-friendly bread on hand. Just toast and eat! 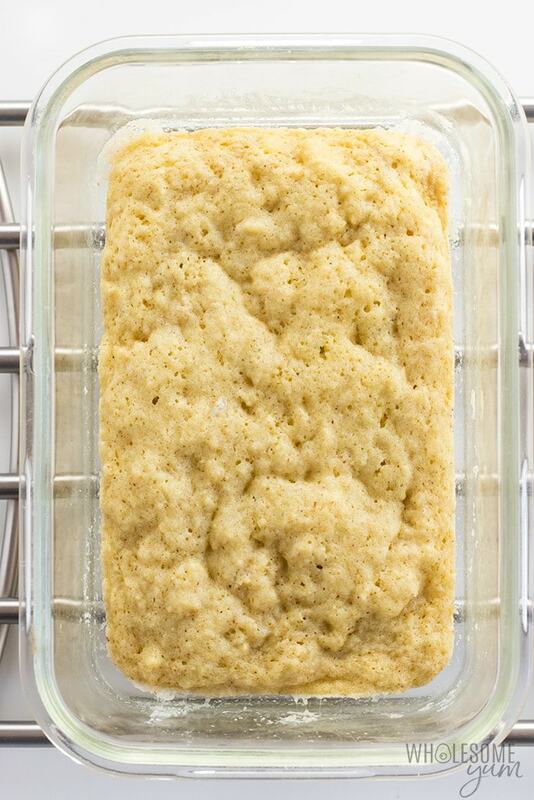 Melt the butter, ghee, or coconut oil in a small glass rectangular container. Meanwhile, in a small bowl, stir together the almond flour, psyllium husk powder, baking powder, and sea salt. Add the flour mixture to the melted butter, then whisk in the egg and stir everything together until smooth. Level the top with the back of a spoon. Microwave Method: Microwave for about 90 seconds, until firm. Oven Method: Bake for about 15 minutes at 350 degrees F (177 degrees C), until firm. Run a knife along the edges, then flip onto a plate or paper towel to release. Cut in half to form two thick slices. You can slice each piece in half for thinner slices if desired. Toast in a toaster for best results (highly recommended). This improves texture and reduces any egg-y flavor. Blanched finely ground almond flour, like this one, is recommended for the best texture. Some brands of psyllium husk powder turn purple after cooking. This is safe to eat, but looks unusual. I use this psyllium husk powder and it has not turned purple for me. Click or tap on the image below to play the video. It's the easiest way to learn how to make 90 Second Bread! Logged in as Kathleen Gordon. Log out? Hello, this is a very nice recipe. I make this in a little plastic five and a quarter inch square sandwich box. It comes out rather thin. I try to slice it in half in order to get two slices, however it’s too thin. aside from doubling the entire recipe, is there a way to simply make the bread thicker so I can slice it in half and have two slices? Hi Mike, I made this in a rectangular container and cut it in half across, not sliced. You’d just need a smaller container if you want to slice it. You’d need to either double the recipe or use a smaller container. Just adding some ingredients but not others won’t work. I cannot thank you enough for this and the 90 sec. 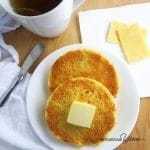 english muffin recipe. In Denmark we eat open faced sandwichs that just cannot exists without a sturdy bread base. It’s a national icon and this recipe kept me in the country!! The “white” bread I spice up with cardamom or cinnamon or loads of vanilla and just plain butter for the weekend mornings. To this, I added a lot more husk and it was perfect for my lunch. Whoever came up with this idea… Give her a prize!!! It was delicious! My new go to because I love sandwiches. I enjoy making your 90 second Keto bread, but what can I do to make it not soooo dry? Hi Peggy, It should not be dry. It’s hard to say what went wrong without seeing what you did, but if you used all the same ingredients, I’d guess it was cooked too long. Hi Maya! This is my go to Keto bread recipe. It’s quick and satisfies my craving for sandwiches. I top it with mashed avocado with a pinch of himalayan pink salt, a little squeeze of lemon, and a dash of paprika. Then I top it with a thin slice of onions and tomatoes. You can add arugula with it. I follow your tip of toasting it first to take out the “eggy” taste/smell. Thank you for this wonderful recipe. i’ve yet to try the white keto bread. I was wondering if I can use Xantham Gum to substitute the Psyllium husk? Hi Melissa, I don’t think so, the volumes are too different. Hi I’ve just made your recipe now, I haven’t tried it yet but I found it rather thick to spread before placing in the oven. I was just wondering about the conversion table. I started off with tablespoon and teaspoon measurements (although I must admit I don’t really know how much a tablespoon really is so I did rounded ones. But then, after putting it in the oven, I checked out the metric measurements and for the 3 tablespoons of almond flour, it said 21g!! Surely it can’t be?? That might be per tablespoon, but not all three? Have tried many 90 second breads by far this is the best… Fantastic!!!! This is a wonderful recipe. Thank you for sharing! Bread in 90 seconds! Amazing! I do have some almond flour in my fridge so I will have to give it a try! Oh wow, I didn’t know making keto bread would be so easy. This recipe was really great and bread was so delicious. Soft and flavorful. Being GF, I’m always looking for new ways to make bread. This one looks like a winner. Can’t wait to try it. That husk powder sounds interesting. It always amazes me how people figure these things out. Definitely going to get some and try it before sharing with Dad. I made this twice, once in the microwave, once in the oven. I think I prefer the oven. I used a glass bread pan both times. My bread didn’t get thick enough to slice in half. When I cooked it in the oven, I added some bagel everything seasoning to the top. I love how light the bread is compared to the heavier feel to bagels made with coconut flour. This is another slam dunk. I made a cold turkey and cheese and a warm grilled cheese sandwich with this recipe! This recipe really scratches that “sandwich bread” itch. THANK YOU!! This was delicious!! I added some chopped pecans before microwaving then I topped with low carb chia strawberry spread and it was like eating the real thing!! I had missed something sweet with my coffee in the morning and this hit the spot! Thank you! I made a 90 second keto bread without the psyllium-was not in the recipe-and it tasted very eggy. Does the psyllium help with that? Also, does baking the bread in the oven give it a different texture? Hi Maria, Yes, the psyllium does help. Toasting it also helps. Texture is similar with baking, but it gets more golden. Excellent, made it exactly like the recipe then split it and toasted. Will be making this again for sure. I love bread and have not had ANY since starting keto 3 months ago so was very anxious to try this. Not only is it super simple and quick but tastes GREAT!!! I am so pleased! 10pm and I decided now was the time to try this recipe for the first time. Made it in round 4″ dish then cut into three slices. Hmm… Pizza? Threw the slices on the Rival Pizzazz to toast, whipped up some 20 second pizza sauce, shedded 10 second mozzarella, put both on the toasted slices with pepperoni and salami and olives, then waited. Pizzas came out perfect. This recipe was perfect for it. Probably because of the other additions we didn’t taste the egg. I haven’t had anything breadlike in over three months. This was awesome. AWESOME! I will use this recipe again and again. Hi your bread turned out great, no queries about that, BUT I have a big question in regards to calorie count. When I did the math, I came up with over 300 calories. Which did in fact make it equal to most other 90 second bread recipes I had found. Disappointing. Your 3 Tablespoons of almond flour alone takes you past you calorie prediction. Hi Eileen, I’m glad you liked it! This recipe makes 2 servings (2 large slices). A serving is 1 slice, and the nutrition info listed is per serving. Love love love this and how easy it was! Our family loves this bread. I make several batches at a time & put in a 9 X 11 glass pan and bake in the oven at 350 F & then cut into squares when cool & cut each square in half. Thank you, Sharon! I don’t have a coconut flour version yet, it wouldn’t be a 1:1 replacement. In the meantime you can try this coconut flour bread. Can you give me amounts for making a whole loaf at a time? It depends on the size of your pan and how tall you want the loaf to be. I’d suggest multiplying the recipe by 8 and starting with that, then adjust for next time if you want a different size. I will admit, mixing it up I was a little skeptical. I used a 6×8 inch glass dish and I thought there is no way this will work. I thought it would be way to thin and way to eggy. But it turned out great, I cut it in half to make 2 slices of bread. 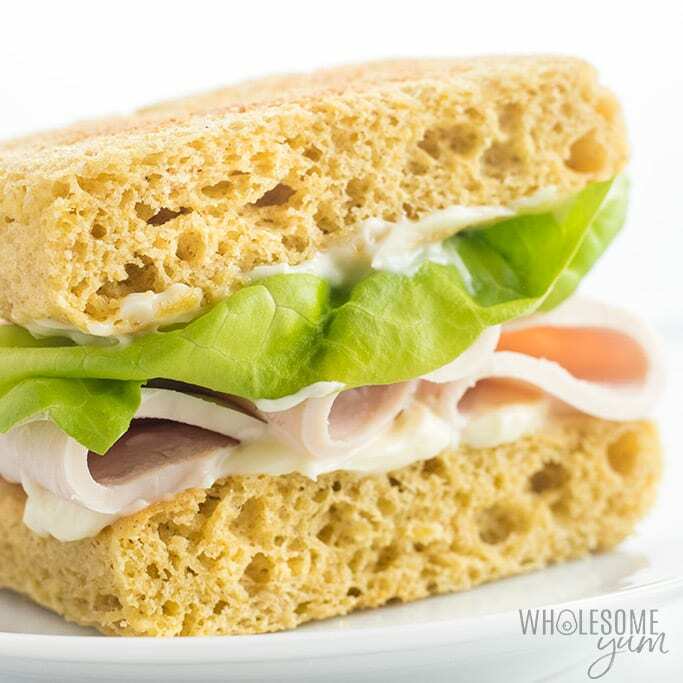 It held up great in my panini press, we love hot sandwiches and have been missing them. My husband says it was really good and I can make sandwiches like that anytime. I am so happy you and your husband liked the bread, Emily! Thank you! I’m confused… the configuration is adding another egg for every 2 slices of bread…. so for a regular 20 piece loaf, I’m supposed to use 10 eggs!?? Hi Nikki, This recipe makes 2 very large, thick slices (about 6×4 inches each and 1/2-inch thick). You’d only need 10 eggs if your pan was at least 10 inches long, 6 inches wide, and at least 4 inches tall. Otherwise I’d probably not multiply the recipe by that many times if your pan is a more typical 9×5 or 8×4 loaf pan. Your recipe would be a lot more useful if you had included the AMOUNT of each ingredient. Hi Elaine, Are you in Safari reading mode? Ingredient amounts don’t show up correctly in Safari reading mode, so switch to normal mode and you’ll see them. Hi! I’m new to your site. I have a question, can we buy the ingredients in the store and which ones do you recommend? 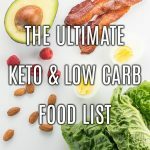 I’m so new to Keto and just trying to learn as much as I can. The Psyllium Husk Powder, is that the same as Bob’s Red Mill brand? Hi Alicia, Welcome to the site! I hope you come back often. Many ingredients are available in store but some area easier to find online. All my recipes have links to the ingredients I use on the recipe card, so you can click those to buy them. To answer your question about psyllium husk powder, Bob’s Red Mill brand does have this product and there are others. This is the one I used for this recipe. This turned out really good! I made one last week that wasn’t as good, I think the psyllium husk adds a bit of a sturdiness to it and butter taste better than oil, lol, duh right! Thank you for the recipe. I am so happy you liked it, Lola! Have a great day! Hi Jodi, The nutrition info on the recipe card is correct. Sometimes there are discrepancies with calculators, but my nutrition info comes from the USDA Food Database which would be the most reliable. That being said, it can vary depending on the exact ingredients and brands you use. I made this yesterday and loved it. It was the first Keto bread recipe I tried and will definitely be my go to. I didn’t have the Psyllium husk powder but it was still great. Thanks for all your great recipes!! I am so happy you liked it, Jodi! Have a great day! I didn’t have the psyllium husk powder either, but since I’m not gluten intolerant I used Vital Wheat Gluten (really high protein and low carb – 4 carbs per TBSP – and this recipe calls for only one tsp! Yea!!). This really increased the protein and even though I hate trying new recipes that I have to make substitutions, this was GREAT!! Thank you! I’m new to Keto, and this recipe will make the difference for me, I’m sure! LOL Love your blog! I loved this one. I was really craving bread and this hit the spot. This is the first bread recipe I have ever tried and will be my go to. I didn’t have Psyllium husk powder so I skipped it. Can’t wait to try it with it. Thank you for all the great recipes!! I love this recipe. So easy and quick. 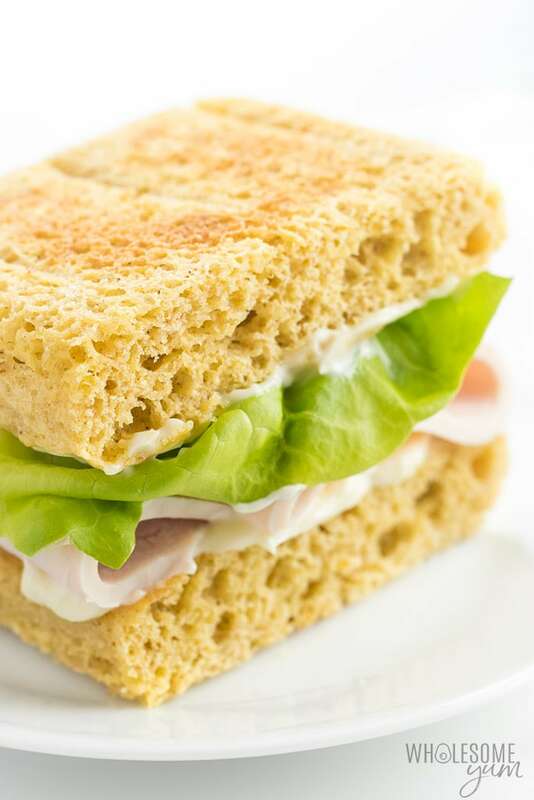 And the most important aspect: it is the best low carb bread that I have tried. Good texture, no weird taste, it is excellent. Thank you for sharing this recipe. Highly recommended. Best darn grilled cheese ever! I added 1 tsp of ground flax. Yum! I am so happy to hear that, Kathleen! Thanks for stopping by! I gave this a try and added pumpkin seeds, cinnamon and a little erythritol. I love this very easy and fast to make. I love that you can make this Keto/Paleo because we have both living in the home. Yahoo I can have bread whenever I want and not pay $6.00 for a small loaf. Yay! I am happy you like the bread, Sandra! Thanks for stopping by! This is a great recipe! It really does have a bread-like texture. I actually used ground flax seed because I don’t use psyllium husk. Thank you, Lori! Good to know that worked for you with ground flax seed. Is psyllium fiber powder the same thing? I feel like it is but I want to make sure! Hi Malaika, Yes, it’s the same thing. Hi there, Just tried the bread! It was delicious! When I looked at the nutrition, it came out that there is a lot more calories, fat and carbs in it than the recipe shows. I love the bread – just wanted to let you know! Hi Claudia, I’m glad you liked the bread. Nutrition info for all ingredients comes from the USDA Food Database, so is accurate. Does it work to grind psyllium husk flakes into powder? Hi Sara, Yes, you can! Just grind finely and then measure for the recipe once it’s ground to a powder. Great texture…I baked a single recipe in my small cast iron pan and it came out beautifully. Still a bit too egg-y tasting but will read the comments and see if someone came up with an alteration that would help this. This sounds GREAT! Can’t wait to try. What size is the small rectangular dish is it? doesn’t sound like a 9×13. Thanks for stopping by, Diane. This is the dish I used. Enjoy! I am so happy to hear that, Sandie! Thanks for stopping by! It tastes great! Mine got stuck to my glass pan though, any suggestions? I’m glad you liked the taste, Anna! It could be that it needed to cook a little longer. It tends to stick if it’s not fully done. Otherwise you can also grease the pan first to be on the safe side, though I usually don’t. Really good. I added different spices and used different size containers to cook the bread in. I did 4 different times. One flavored for spicy sandwich bread, another for pizza bread round and a smaller round for breakfast to use with eggs/bacon/cheese so I added cheese to bread mix without affecting cook time. Finally did one that has a slightly sweet taste with cinnamon and a bit of Swerve. I wondered if adding the Swerve would affect cooking but it did not. It was not real sweet but met my sweet tooth that night while making. I love all of your fun suggestions, Lynda! Thanks for sharing with us! My son loves toast with peanut butter and honey. I made this 90 Second Keto Bread, toasted it, and added peanut butter and Sukrin Gold Fiber Syrup. Awesome!!! I am so happy your son liked it, Kirsten! Thanks for stopping by! I feel like I died and went to heaven. Have been eating burgers bunless, but no more. I ate the whole thing after slicing in half and toasting, for a whole 2 net carbs, wow! And very filling. I am so happy to hear that, Deb! Please come back again soon! Hi—-and thanks. Your 90 sec bread recipe motivated me to start low carb bread making again. Something i needed very much to do. I liked it as is, but decided to try this: 2 tablespoons of almond flour and 1 tablespoon of oat fiber (and the other ingredients as listed—the psyllium husk is a stroke of genius). I think the texture and taste is more “bready”—-less almond flavored this way, and worth a try for anyone who has some oat fiber on hand. Also a little lower in carbs, but not much. Thanks again for your inspiring website and this recipe. I am so happy you stopped by, Maria! Have a great day! I am allergic to almonds. What to use instead of almond flour? Hi Susan, You can try sunflower seed meal, but the flavor would be a bit different. I might just be drawing a blank, but I cannot find the amounts of the ingredients to make this recipe. I HAVE all the ingredients but how much of each am I using? So sorry if it’s somewhere in the article but I cannot find it. Thank you!! Hi Becca, The ingredient amounts and instructions are on the recipe card right above the comment form. I modified this a bit and it tastes much more bread-like to me. Instead of 3 T of almond flour, I used 1.5 T almond flour, 1 T coconut flour and 0.5 T flaxseed meal. It did not smooth out as well, but did a great job with wet fingertips! Thanks for sharing your substitutions with us, Jeannine! Hi Maya. Just wanted to say I have just tried this and so far love it (hoping that it was not beginners luck) I have been placed on the FODMAP diet and buying bread to suit gets rather costly. This costs very little and very little time to make, so now I have fresh bread to make first thing in the morning for my lunch at work. Love this web site. My next try will be the low carb loaf to trick my naysayer friends that it’s just as good but better for them compared to their store bought loaves. Good luck with the bread, Shane! Thank you for stopping by! Thank you so much, Catherine! I love hearing that. Do I need to use gluten free baking powder? Hi Juli, Any baking powder will work! Better in oven or microwave? Hi Christine, It works in either one! Delicious and easy! To make it ahead of time, would I toast it now or wait until I’m ready to eat it? Thank you, Lynda! You can make it ahead but it’s best to toast it right before eating. Is there a difference between gluten free baking powder and regular? My bread didn’t rise and doesn’t look at all like yours. It was also very hard to get out of the glass pan. Hi Cheryl, There is no difference in terms of rising. Many brands of baking powder are naturally gluten-free, just not all, so I mention it just in case for people that want to be GF. If your bread didn’t rise, it might be that the baking powder isn’t fresh enough, or it could be that the batter wasn’t mixed well enough. I’d check those two things for next time. Made it just like the recipe but added Trader Joe’s Everything seasoning and a pinch of stevia powder. Cooked it in a 12 oz ramekin in the microwave. 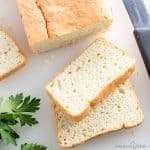 Best keto bread I’ve tried! Excellent texture, excellent flavor, and very durable. Next I’ll try quadrupling the recipe to make enough for 4 sandwiches. Thank you! Thank you so much, Vince! It sounds delicious with that seasoning. I actually quadrupled the recipe last week, using several larger containers at once, and it worked great (with a bit longer cook time). Hope it worked for you, too! Have you ever made it in a glass pie plate and used it for pizza crust? I love this bread and I am dying for a pizza. Tried them all and they don’t taste good to me. Hi Linda, I haven’t tried that. I think this would be too soft and fluffy for pizza crust, and the batter likely would be too thin to press into the sides of a glass pie plate. Have you tried this fathead pizza crust? Oh my gosh!! I was so nervous but hopeful about this recipe… It was FANTASTIC! I really, really do not enjoy eggy flavored anything (other than plain eggs). This was awesome and I just finished eating a delicious BLT. Thank you so much! I am so happy you liked the bread, Michelle! Thanks for stopping by! So I couldnt find psyllium husk powder anywhere. So I substututed flax seed that tried to make flax powder (fail), they still looked whole. I used the flax any way and about 1/16 teaspoon of xanthan gum powder, otherwise everything else was the same. It turned out really good. I liked the crunchy flax seeds. Thank you for sharing, Deana! Good to hear those substitutions work. If you ever want to try with psyllium husk powder, the link to the one I use is on the recipe card. I was soooo skeptical about this recipe. I tried it tonight. I can not believe how wonderful it taste as well as the fact that the texture is excellent. I used orange flavored psillium husk powder and it made the most wonderful toast and eggs. I am very excited to try your other recipes now. Thank you very much for your commitment to finding the perfect , and so very easy, recipes. Thank you so much, Diana! Toast and eggs with this sounds awesome. Thank you. I will try his recipe. Hope you’ll like it, Marsha! This the the best 90sec keto bread I’ve had. Thank you, Maya. I’m so happy it’s only 150 calories and 1g net carbs. I have it with sliced cheese and tuna with olive oil. It’s so filling, I feel full for hours. Thank you, Esther! Having it with sliced cheese and tuna sounds amazing. These are really great! SO useful when low carbing and gluten free (Using GF baking powder!). Thank you so much!! I’m so glad to hear that, Doreen! Thank for stopping by! Delicious! So excited to have bread that quick and easy. Maya, we used this bread for breakfast sandwiches this morning. It was unanimous that this is the best sandwich bread our family has had since going keto 9 months ago! It is perfect. Thank you! Thank you so much, Jeanie! I love hearing that! Can this recipe be doubled or even tripled and baked in a larger dish? Hi Susan, I haven’t tried that yet, but possibly! I’m not 100% sure if it would rise enough and cook through with a larger batch. You might need to use a lower oven temp like 325 and bake for a while. Let me know how it goes if you try! And we made no other changes. Hope that helps. Just made this for the first time. So easy, love it. Thank you. Don’t have psyllium husk powder. Can I use an alternative? Hi Linda, Psyllium is required for this recipe, otherwise it turns out totally different. You can get it here. I would love to try this. I could not find the amounts of the ingredients. Hi Sheila, The ingredients and instructions are on the recipe card right above the comment area. I haven’t heard of pysillium husk flour before. What is the equivalent product in England? I am keen to try the 90sec bread. Hi Marjorie, It’s the same product in the UK, but looks like different brands are available. Here is one you can get in the UK. What are the dimensions of the glass container that you use for this recipe? It sounds great! Hi Maureen, This is the glass container I use. The container in your Amazon link is 8 x 6 x 3. The amount of batter the recipe makes wouldn’t be enough by my calculations. Am I wrong? I made it yesterday in a 4×5 glass container, because all I have, and sliced it in half crossways. Today I doubled the recipe and baked it in a 5 x 5 square container but it isn’t thick enough to slice crossways and too small to cut in half. I love the texture and taste and want to make it again after I hear from you about the container size. The containers in the link are the exact containers I used and the pictures show the result. The batter doesn’t fill the container to the top. But, I just measured the containers and they are smaller than the 8×6 dimensions listed. They are rectangular, so you’d end up with less surface area (and a greater thickness for slicing) than a square container. If you want slices exactly like mine, you can just get the containers linked in the post. Otherwise, definitely feel free to experiment with any that you have. The recipe will still work, you’ll just end up with different sizes/shapes of slices. Wow! Thank you for your speedy reply, Maya! I just ordered the containers from Amazon. How about giving the correct measurements for a loaf size gluten free bread recipe? That’s good if you’re doing a coffee mug size 90 sec bread. Thanks. Hi Peter, I don’t think this recipe is suitable for a loaf, at least not in the microwave. I haven’t tested increasing it that much for the oven. 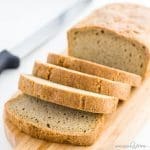 But you might like my other low carb bread recipe here, which also uses almond flour and psyllium. Is non-blanched almond flour better than the blanched or the vice versa? Hi Lucy, Definitely use blanched finely ground almond flour. That’s best for the right texture. I added a note on the recipe card for the one I use. Thank you so much, Theodora! I’m so glad to hear that!